The bats were hot for the Gannon University softball team over the weekend as the Knights swept a doubleheader from Edinboro, 5-3 and 7-3, Saturday at home and split with California University of Pennsylvania in Slippery Rock Sunday, losing 4-0 and winning the nightcap 5-2. Taking three out of four over the weekend left Gannon with an overall record of 15-10 and a 4-4 mark in Pennsylvania State Athletic Conference play going into Friday’s 2:30 p.m. doubleheader at Slippery Rock. The Knights also will battle Mercyhurst in a 1 p.m. doubleheader Saturday at McConnell Family Stadium. Gannon rebounded from a doubleheader sweep at the hands of Seton Hill on April 2 by sweeping Edinboro Saturday. 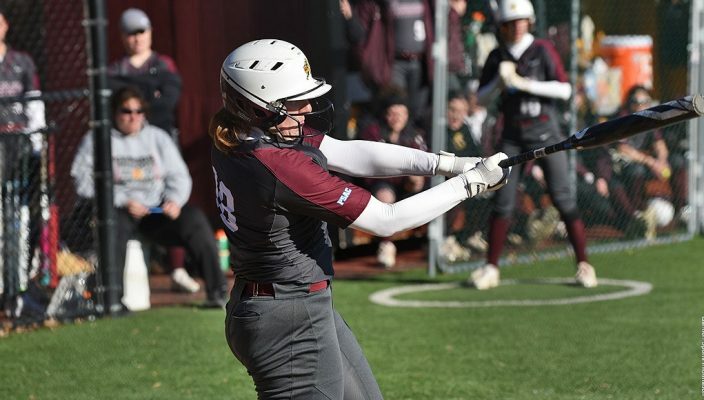 In Saturday’s opening game, Sarah Ingerick’s solo homer in the first inning helped Gannon erase a 1-0 deficit and four batters later, Rachel Tanilli scored Lisa Szajn with an RBI single. After Edinboro tied the game in the third, Ingerick and Szajn both recorded RBIs in the fourth to give Gannon the lead at 4-2. Ingerick added another RBI in the sixth to close the scoring for the Knights. Ingerick led Gannon with two hits, including her home run, and three RBIs. Kennedy DeMatteis earned the win in the circle, allowing only six hits and striking out one batter. Taylor Wilp’s first home run of the season and Tanilli’s RBI single put Gannon up 2-1 in the second game, and Gannon added more offense in the sixth inning. Szajn hit a two-run single to start the scoring. Kaity Stocker then blasted a two-run home run to make it 7-2. Madi Beining earned the win with seven strikeouts. On Sunday, the Knights were not as lucky, as they were shut out for the sixth time this season in the opening game before bouncing back to win game two. Ingerick, Szajn and Autumn Smith recorded the only hits for Gannon as they were outhit 10-3 in Sunday’s first game. Kennedy DeMatteis had five strikeouts in four innings. Freshman Rebecca Tatone saw her first action of the season, pitching two relief innings with one strikeout. In the second game of the day, the bats were quiet until California jumped out to a 2-0 lead in the third inning. But Stocker drove in Maria Taliani in the fourth with a double to cut the lead to 2-1. Stocker continued her hot hitting with a homer in the sixth inning – her team-high sixth home run of the season – to tie the game at 2-2. Taliani broke the tie in the seventh inning when she blasted a three-run bomb to center field to give Gannon the win, 5-2. Beining shut down all three batters she faced in the seventh inning to secure the win. Beining’s win is the 31st of her career, which moves her into 11th all-time at Gannon. Taliani said the Knights finished the weekend in good shape.